The introduction of genius hour projects to your students needs to be amazing! This is likely the first time that your students have ever been told that they can work on anything they want within the walls of the school. You don’t want to mess up this incredible moment. Like a good book or movie it is the teacher’s responsibility to build suspense before letting the cat out of the bag. The week prior to my genius hour launch I kept telling the students that I had something very special to share with them on Friday. If your students are like mine, you may want to clue them in that it isn’t something they can eat. The reality is that many students put a higher priority on eating that something as cool as a genius hour project. I simply can’t compete with Jolly Ranchers, so I made sure to shoot that idea down immediately. On the day that you introduce genius hour projects show them an inspirational video before unveiling the project. If you saw the home page of this website then you know that I’m a big fan of Kid President and so are the students. I challenge anyone not to smile while watching his video. After showing this video you will have every eye on you waiting for your next move. The next thing that I do is show a pre-made Haiku Deck that explains the very simplistic rules of genius hour. Haiku Deck is an iPad app, but you can have the same impact with a PowerPoint or SMART board presentation. It’s only natural that students will be skeptical about what you are telling them. I asked my students how many were a little scared about our genius hour projects before I even took a question and the majority of the hands in my class went up…including my own. Let the students fire away question after question, but be prepared for the following questions. I put my responses in red. Yours may vary. Students should not be expected to come up with their ideas on the first day that you introduce the idea of a genius hour projects. A great idea would be to show students what other students their age have done in the past. Here is a list of my current genius hour projects from my 6th graders. They need to know that it’s OK to do a documentary of farm life, or that it’s OK to do a project about how to make hair bows. I spent the remainder part of my class brainstorming ideas. Every idea is good at first. It your job as the teacher to eventually categorize the ideas into good and bad ones and to explain why you categorized them that way. Pro Tip: If a the idea or question can be answered on Google in less than a minute, then the idea is probably not a very good one. 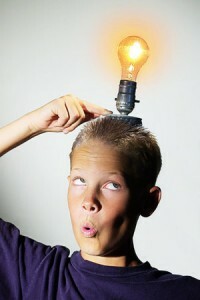 Send a letter or email home to the parents letting them know that you are doing genius hour projects in your classroom. Here is an example Google Form that you could use. Let them know that you would like them to help brainstorm with their students on their topic ideas. I’m sure that many parents will appreciate the insight into your classroom, and we all know that parents have opinions. Good luck with the introduction process! Please comment if you have any questions about the process. I am interested in doing Genius Hour with high second graders. Where should I start learning about the process? Thank you. I am so excited to start this in my classroom next semester! Thank you for all of the information and resources. This is wonderful. I am a sixth grader doing genius hour. What is the rubric/ instructions again? I have a question. You will need to get with your teacher to find out his/her exact rubric. Each teacher will have different directions. I am planning on starting this when we return to school next week. I’m so excited about the prospect of my students feeling confident about themselves and their abilities. Thank you for the details you have provided. I have introduced it and there was excitement. Now some kids are off and running but many are spinning out in the mud. They struggle to do independent work things without getting off topic really quickly, distracting others and just letting the time tick by. How much support do I give them before I am really just framing and doing their assignment. This is a grade six class. I would say that you are absolutely going to have to help 6th graders get steered down the right path. That is the age level that I have done GH with also. Some of them will need a lot of help throughout the process. I’d much rather help them out and steer them in the direction I think that they should be going rather than let them suffer through something that is ineffective. Thank you. These Q & A’s helped. I’m interested in doing the Genius Hour with my 10th grade AVID class. This will be the last quarter of the school year and I’m thinking it would be a great way to end the school year. Where do I start? What knowledge must I have? Can I do a project? I definitely think you can do it. Read through the articles here, on the genius hour wiki, and the genius hour livebinder. There is a wealth of information out there. I have a second grade class and was wondering if anyone has introduced Genius Hour to students this young? Did it work? How did you make it work? Students are 6-8 years old.